If you get a bit of a knot in your tummy every time someone says music theory, then this page will be a bit of a help. Without getting into deep technical torture, it introduces you to everything that you need to get started and to get going. The theory presented in this section is all that you need to take you from raw beginner to your first performance piece. Notes on the guitar (musical notation for the guitar) is written on the 'treble clef' as indicated in the music in the figure below. One way of learning them is to separate the lines from the spaces. The notes on the lines are shown in the staff below. They can be remembered through a sentence Every Good Boy Deserves Fruit. The notes in the spaces are shown in the staff below. They can be remembered through the word F-A-C-E which spells the letters on the staff. Note value refers to the duration of the sound which the note represents which is determined by the form of the note. Each of these notes has a rest or a period of silence which corresponds with the value or duration of the note as indicated in the music in the figure below. Dotted notes occurs where a dot is placed immediately after a note or a rest. The note increases the note by the value of half the notes value. When a second note is added its value is equal to half that of the second note. You will rarely encounter this in the beginning stages of playing music and, with the exception of counterpoint, rarely in guitar music. Note value refers to the duration of the sound which the note represents which is determined by the form of the note. Each of these notes has a rest or a period of silence which corresponds with the value or duration of the note as indicated above. The time signature can be found at the beginning of a musical score. It consists of two numbers: one on top and one at the bottom.The top figure shows how many beats in the bar and the bottom figure shows the kind of note in the bar. In the example above, there are 4 beats in the bar and each beat is equivalent to a quarter note or crotchet. 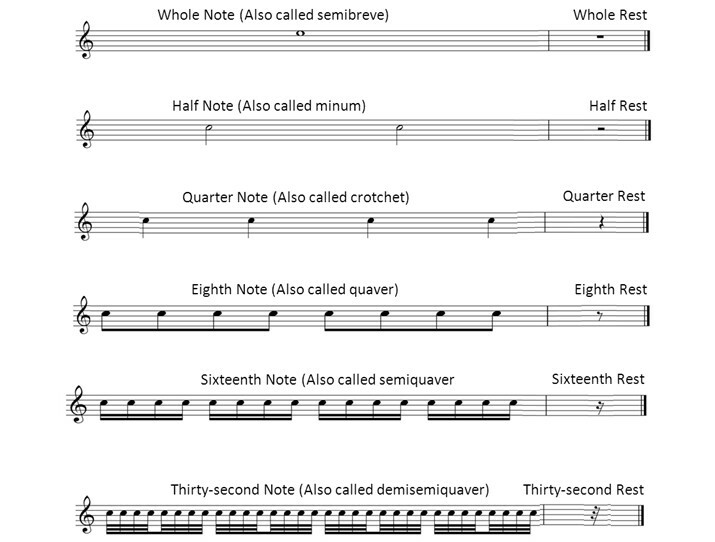 The list below provides the type of beat indicated by different figures: - 2 = minums (half note) - 4 = crochet (quarter note) - 8 = quavers (eight note) - 16 = semi quavers (sixteenth note) As seen in this table, the notation of half note, quarter, eighth and sixteenth note are a good indicator of the value of the note.